Being a working mom, I find that I barely spend 3 hours of awake time with the girls on weekdays. When the weekends came along, I found myself trying to shop and do stuff and in the process, not spend as much time as I want to with Sugar and Spice. So two weeks ago, I made myself a promise that regardless of what was on my agenda, every Saturday would be spent with the girls. This did two things for me. Made me plan and consolidate my trips with easy twin mobility in mind and I also look for venues that will provide a stimulating change for the girls. Our first trip together was to Costco and we had a fun ride in the double carts. For the second week's Saturday and in the hope that I can groom children with more appreciation for the cultural things in life, we took a family trip to the Children's Museum of Houston. They are very proud of their ranking as the number 1 children's museum in the US and I was very curious to see if they'd live up to their billing. They did. There were screaming loads of children having a great time within the various exhibits, from a kidtropolis where they can do "jobs" and withdraw money from an ATM to the matter factory offering science educational play. For us though, we headed straight for the TotSpot. The Totspot is specially designed for children under 35 months. It includes mini-buildings for exploring, mirrors, balls and lots of opportunities for sensory play. At one end of the TotSpot was the location for the youngest of babies who were not yet mobile. We spent all our time here. It had two bumbo chairs, mirrors, hanging lights and toys. Plus on the wall was a rolling cylinder with faces of crying babies. I didn't get that, but when I put the babies on the bumbo chair in front of it, they instintively knew how to turn the disc. We were able to play without fuss for 30 minutes and for 7 month old babies, there's not much more you can ask for. There wasn't really anything in the infant section that you can't get in a well-equipped daycare, but this is still a nice, safe place for some baby playtime. For older kids though, this place is AWESOME! Our adoring aunty was kind enough to nominate us for Best Parenting blog by a Nigerian. Would you be kind enough to vote for us here. Thank you and muuuah! Earlier in the month, I posted about Sugar and half an orange here. I concluded the post with a speculation about mesh feeders. Well, speculation time is over. After that post, I did a little research and settled on the sassy mesh feeder but never got around to using it until yesterday. Home alone with the girls (too sick to go to daycare) and not in the mood to defrost food cubes and not sure the girls will have an appetite for solids anyway... light bulb moment! The girls lurved it. They took their time inspecting the feeder for the first few minutes and then tasted the contents and it was all hums and drool for the next 30 minutes. Their first self-feeding experience was a mother's pleasure to watch (and pain to clean up). So now, I'm researching other foods that do well in a mesh feeder. Self-feeding part deux - Pass! If there is any such thing as the Donna of Baby Food, Ms Annabel Karmel would be a strong contender for the title. According to her Amazon author profile , she has written 16 books and sold over 3 million copies all on the topic of feeding children. I first heard about her from my sister and own a copy of her Top 100 Baby Purees which I referred to extensively on my first attempt at making baby food. When I saw this book in the library, I was quite excited and checked it out. What I loved most about this book are the photos and the descriptive choice of words. It really takes the guesswork out of the process. Ms Karmel got my attention with her take on the necessity (or not) of using organic products. (The copy I read was published in 1999 so I don't know if she still maintains that stance today) I also liked the ideas in the menu planner and the more adventurous nature of the combination purees. If I did not have access to wholesomebabyfood and had never prepared baby food, I'd consider this book a keeper. It certainly gets a strong recommendation from me for anyone trying their hand on baby food making for the first time. However, since I already own another Annabel Karmel book on baby purees, I'll not be keeping or buying this one. Now that I'm making my own baby food, it's time to start planning the girls' menu a couple of weeks in advance. This will help me know what to include on my shopping list. Two days after having my beautiful babies, it was time to take them home. After reading all the blogs etc, I was prepared with two sets of clothes for each baby; one premmie size and one newborn size. Well, I couldn't get the premmie sizes past their thigh so they wore the newborn sizes. 30 seconds into her going home outfit, Sugar had her first bowel movement and it was an illustrious one. First bad mommy moment: taking baby home in a tee shirt, a diaper and two blankets. Disgraceful! Once we were home, I was careful to keep all the girls things separate so we didn't have any exchange of germs. It was all good until the time when Spice was screaming for more milk after finishing her bottle and there was Sugar with a good one ounce of milk still in her bottle. 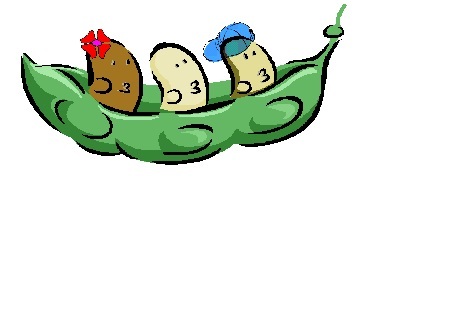 Under normal circumstances, I would make a new bottle for Spice. But this was not normal circumstances, this was 3am in the night/morning. I grabbed Sugar's bottle and stuck it in Spice's mouth pronto. Afterall, they shared a womb for 9 months! Cue to this Saturday. The girls woke up at 7 o'clock like they always do on the weekends and chatted up a storm. Now I know from experience that the chatting would go on till either 7:30 or when the girls see mommy get off the bed. Then chatting will become the baby version of "get me out of this crib, it's playtime" at a very high decibel. So I did what any mother with the need for a shower and a good sense of self-preservation would do. I rolled off from the bed to the floor and army-crawled my way to the bathroom out of the line of sight of the two pairs of cute brown eyes in the crib. I felt really silly doing the crawl, but I also felt clean after the shower so there. Ok, if you read this all the way, you have to fess up. What's your bad mommy moment? I mentioned previously that our daycare has a library of books for kids as well as parents so last week I checked this book out. Why? The set up of the infant room and my daycare's policies (based on the Montessori educational system) have engaged my curiosity. I believe that I see an impact on the way my girls are developing and I'm definitely interested in implementing some Montessori concepts at home. The book itself is easy to read with lots of pictures. It does go up to the teen years but I limited myself to the chapters on infants and toddlers. It includes ideas on activities and materials that stimulate a child's sensory development. Natural materials - The Montessori way encourages the use of natural materials. I am very open to that. I was looking for some musical toys for the girls over the weekend so I went to Babies R Us. I found myself feeling disappointed with the selection of bright, flashy, plastic electronic toys. They cost money to run (batteries) and are actually more interesting to me than the girls. I got this drum and I'm not sure it's a really valuable and educational toy. I'm definitely ready for some non-battery operated toys so my mind is already attuned to the Montessori way. Discovery Box - A discovery box is a box filled with 5-20 items and placed in a place that is easily accessible to the child. The number or items should be a function of the child's age. The idea is for the child to get used to going to the box and picking out items they want to explore or play with. It encourages sensory development and should incorporate different colors, textures, sounds etc. While doing that, the child also gets the concept of keeping toys away . It's a bit too early to make any major decision on the type of educational system I would like the girls to be a part of, but for now the Montessori guidelines on developmental play work for me. If I do decide to continue on the Montessori path, I'll give this book a second read but for now it goes back to the library. I'm not just a mom to twins, I'm a mom to twin girls so clothes shopping comes with the territory. If you've been reading this blog for a while, you'll know that I have a $10 golden rule when it comes to clothes - I do not buy anything over $10. Most times I don't even exceed $5. Gymboree Red Balloon sale in December/January and June: This is going on right now. I used to think their stuff was expensive, but my sister convinced me that I was wrong. They have some awesome deals on off-season items. So if you live in a place with 4 distinct seasons, this is a good time to stock up on long-sleeve items or warmer clothes. Shopping tip: If you go on a less busy day, you can ask the store manager to allow you shop the boxes in the back room. I did that and every item in the box was less than $7 and most were $3.99 - I'm talking dresses, jeans, tops, sweaters, even a few coats. You have to ask nicely though. Carters semi-annual sale in Feb/Mar and ??? : I like carters because well, they're carters. I do hate the fact that they seem to buy one huge roll of material and sew dresses, pants, tops, sleepers, onesies from that one roll. The result is sometimes you show up in daycare and the other kids are wearing the same outfit. It's not a big deal, just sayin'. Of course if you shop ahead for next year, this is less likely to happen. Shopping Tip: Sign up for emails and check their website for printable coupons. Dillards: Yes Dillards! If Dillards is one of the anchor stores in the mall you shop, check out the clearance rack of their children's department when you can. I find Dillards to be super expensive on a normal day, but their deals can also be jaw dropping. Since memorial day, the Dillards in my area have had formal and summer dresses marked down 65% on their clearance racks for $8-$14. The irony of it all, I got a summer dress in Dillards for $10, walked to the opposite end of the mall and same dress was being sold in Macys for over $30. Makes a case for hunting the best prices doesn't it. Crazy 8 semi-annual sale: Also going on currently. Crazy 8 is the little sister to Gymboree and they stock similar styles. I find them to be expensive almost all year round, but their semi annual sale does have some decent prices. Shopping Tip: The store I went to had 3 racks of winter clothes all marked to $3.99. Good price for sweaters and sweater dresses. Feeding schedule is now taking adult form. Early morning bottle is still 530. Breakfast is around 4oz of a cereal plus fruit combination. Lunch is a 70z bottle of formula followed by 2oz of fruit and veggies around 1130. Afternoon snack is a 7oz bottle at 330 PM and dinner is 8oz bottle plus 1oz veggies at 600pm. This month, the girls got a taste of green beans, blueberries, apricots, beets, broccoli, carrots and barley cereal. Next up is the introduction of proteins - chicken and yoghurt at least. Spice is saying some gagas, tatas and dedes. I don't hear any "m"s in her vocabulary yet but I have promised her half my kingdom if she will say "mama" before "dada" (The child does not seem to be the bribeable type or maybe she just figured out my kingdom aint worth much). Both kids are quite mobile without actually crawling, drooling but no teeth. Mommy's impatiently waiting for a "mama", a crawl or a pearly white. Anyone will do. Switching to store brand formula is a cost cutting move that I'm considering; but before I do that I have to answer the question "Are all infant formulas the same?" Let's start from the beginning. In 1980, President Jimmy Carter signed the Infant Formula Act into law. The crux of this law is that it stipulates nutritional standards for all non-exempt formulas being sold in the US. Formulas for special nutritional needs are exempt from compliance with the nutritional guidelines which are set by the Health and Human Services Department. Exempt formulas are those for any baby "who has an inborn error of metabolism or low birth weight or who otherwise has an unusual medical or dietary problem". The guidelines are really what defines the sameness or lack of in infant formula. Protein: Between 1.8 to 4.5 grams. Note the range - so brand X can have double the protein content of brand Y and both are still "in compliance" Also note that the type of protein is not specified. It can be casein or whey. The guideline only stipulates that if a protein inferior to casein is used, the amount must be increased to make up for its inferiority. So formula A can have more protein than formula B because it's protein is actually of lower biological quality than B's. Do you catch my drift? These ranges leave manufacturers with a lot of room to manuver and that's where the answer to the question is. Are all infant formulas the same? NO but in the eyes of the law they are equal. Equal but different. Kinda like fratenal twins. Am I going to switch? I'm still on the fence. If I do make the switch and my girls have an adverse reaction, I will have a motherlode of guilt so.... Let's just say I'm not done with my research yet. At almost seven months old, the monthly addition to my grocery bill for the twins comes from feeding and diapering. To reduce my grocery bill, these are the steps I'm taking to revisit the cost of food and diapers. Currently each baby is taking 28oz of Enfamil formula daily. That's 1680oz per month which comes to around $200. The freebies are beginning to dwindle so what are the options for cutting costs on formula? * Some sort of cloth diapering is another option. I've come a long way from the obnoxious 7-month pregnant woman that I was when I wrote this. Let's just say, I now have some cloth diapers in my possession and am taking a deep breath and tentatively dipping my foot in the pool of cloth diapering. It'll probably take me a month before I can give a status report. No I didn't do another baby food taste test. I stumbled on this link on Saturday and thought to share it. 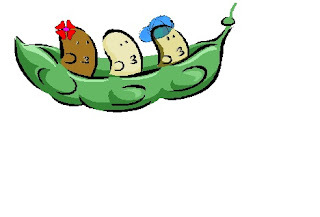 It's a website that has rankings of baby foods and cereals. It sorta confirms what I suspected - no brand gets it right all the time. Different brands get different things right. I stumbled on this link on the US Department of Education website. It's a series of booklets with information on infant growth and development. Each booklet covers a month and includes sections on baby's health, home safety, games to play with baby and family dynamics as related to a new baby in the home. This is an initiative from former first lady Laura Bush and a great free resource for all caregivers. As I was giving the kids their bath yesterday, I sang "goosy goosy gander" lustily until I got to the geriatricide part - you know the part where the old man who couldn't say his prayers got thrown down the stairs. This is the latest on a growing list of nursery rhymes that I've had to stop singing abruptly when the words dawn on me. At this point, I've limited myself to "Baa Baa Black Sheep" and "If You're Happy and You Know". I'm beginning to sound like a broken record but the girls still dig my voice. I know there's a possibility that I'm being finicky. It's highly probable that my repertoire of nursery rhymes is limited but still... what do you think really happened to the baby at the end of "Rock a bye baby". 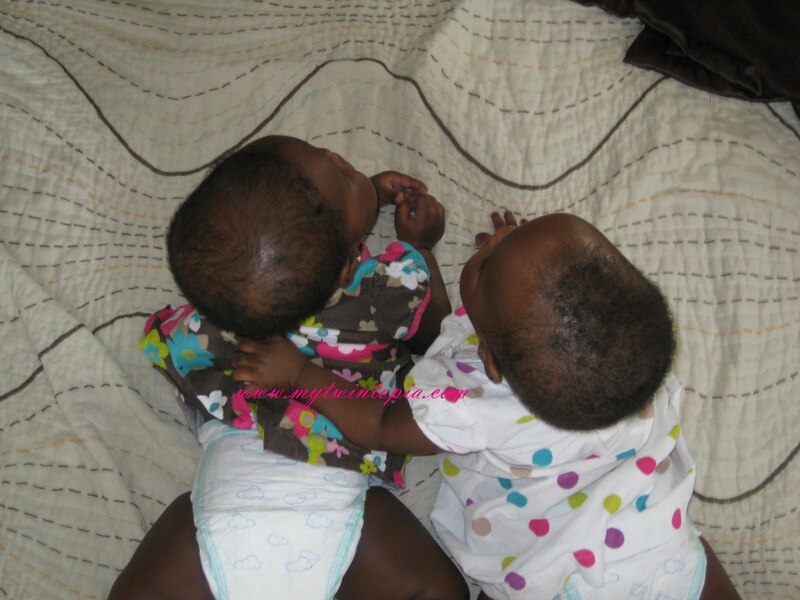 My twins had cradle cap from when they were 2 months old till they turned 6 months. 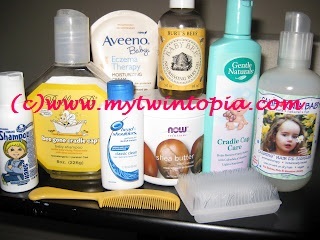 I tried a lot of different cradle cap treatments in those 4 months. Some were successful in reducing the cradle cap and some were not. The picture below shows you my arsenal and I'll tell you more about each treatment option. Circle of Friends Han's Shampoo : We're still using this because it smells like blueberries. Aveeno Baby Eczema Therapy Moisturizing Cream : I used this when it looked like the cradle cap was spreading to daughter's face and it worked. This is a good choice for if the cradle cap spreads beyond the scalp onto the baby's face. It's fairly expensive in stores so I usually buy it online. The link above will take you to the retailer's website. NOW Foods Shea Butter : Pure shea butter. I use this to get a heavier cream on their scalp so it doesn't dry out during the day. I like it. Gentle Naturals Cradle Cap Care : Another nice smelling product which leaves a strangely gooey sheen on my hand. Brush from hospital care bag. It's a good scalp brush and that's all I have to say about that. Almost all of the treatments listed here can be purchased on Amazon.com. Click here to buy. So where do we stand today? Twin A has what her pediatrician calls "male-pattern balding" ie no hair round the top of her head and a little patch of cradle cap about the size of a quarter. Twin B pretty much lost the hair on the top of her head as well but it's growing back now. Her cradle cap is still there milder but still all over the top and front of their hair. Their doctor did say it will go with time and it seems that the only magic product for treating cradle cap is time. 12 months Update: By the time the girls turned 1, all their cradle cap was gone and their hair was growing back healthier and rapidly too. Since I had a post about dealing with baby's old clothes, I might as well talk about the shoes. I shake my head when I think of the fact that my babies actually have shoes. If I was a 100% rational human being, my girls will not have shoes till they can walk. I however seem to have these things call emotions and hormones and my babies have a box full of old and new shoes. Bronzing: That's like "everybody does it" right?! It's the conventional option but the price tag does not appeal to me. 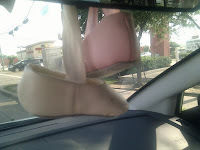 Windshield hanging decoration: I actually got this idea from a car parked beside me in the grocery store. I like it. This is the one I went with. Of course, if you have or are going to have say 6 kids, this may not be a good idea - driving visibility and all! I'm glad the shoes come in twos. I have one foot of each hanging off my windshield (makes me happy just seeing them during my daily commute) and the other foot is going to be hanging on the Christmas tree come December. And that is more useful time than the 55 minutes they spent on babies' feet. Over the weekend, we experienced an unexpected milestone. While mommy's back was turned, daddy gave Sugah a taste of half an orange. I turned round and screeched said "No, she's not supposed to have thatbefore she's 12 months old". Daddy took the orange away and my sweet little girl went ballistic. She threw her head back, arched her back and kicked and screamed and focused red laser beam eyes on the much-desired half orange which was now out of reach. If only her hands were longer than 8 inches! If only she could crawl! She'd have shown us!!! Anyway, after calming said offended child and as I settled in for the night, it hit me (My genius moments are usually just before bedtime or in the shower). These kids may just be ready for some form of self-feeding. I know they are now quite skill in removing, twirling and reinserting their pacifiers (except at night when mommy gets to be the pacifier fairy). I don't think they're ready for finger foods just yet, but I see a mesh feeder review in my future. Or what do you think? Have an awesome weekend. Me, I'll be visiting a hair salon for the first time in over 2 years. Wish me luck.